The promotion of fake news is a big problem that sites like Facebook and Google are scrambling to fix. Both companies have made efforts to bury bad links from their algorithms, but some stories are still slipping through. 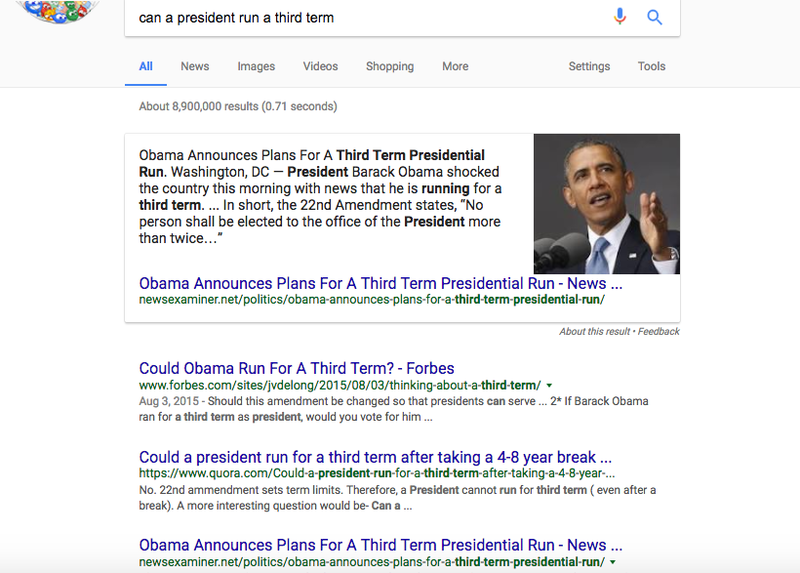 Right now on Google, if you type in "can a president run a third term," the top result shown is fake. An answer from the site NewsExaminer.net pops up in Google's featured snippet section and claims that President Obama "shocked the country this morning" by announcing he'd be running for office again. Which of course, a president of the United States cannot do. Google says articles for its featured snippets and summaries section are chosen programmatically (by algorithms, not humans). "When we recognize that a query asks a question, we programmatically detect pages that answer the user's question, and display a top result as a featured snippet in the search results," the company writes in its description of featured snippets. Google Home, Google's personal assistant hardware, uses top Google snippets to populate the messages it reads back to listeners. I tested the same question, "can a president run a third term," on my Google Home and got the same NewsExaminer story. You can watch my Google Home give me the fake news answer here. When asked "Can a president run for a third term?" Google Home did say the 22nd Amendment to the Constitution, enacted after President Franklin D. Roosevelt was elected four times, now imposes a two term limit, citing InfoPlease. After the Boston Marathon bombing in April 2013, Obama spoke at an interfaith service for victims' family members and other survivors. Speechwriter Terence Szuplat said that in the opening lines, the president set the scenes of how quickly a joyous day turned dark. "And then, in an instant, the day’s beauty was shattered. A celebration became a tragedy," the president said in the remarks at the Cathedral of The Holy Cross in Boston. Cody Keenan highlighted the historic significance of America's first black president speaking at the 50th anniversary of the Selma to Montgomery marches. This line was added in by the president himself as the team worked on edits before the anniversary event in Alabama. He went on to say in the speech, "Because the single most powerful word in our democracy is the word 'We.' We The People. We Shall Overcome. Yes We Can." "The truth is, being an American is hard." 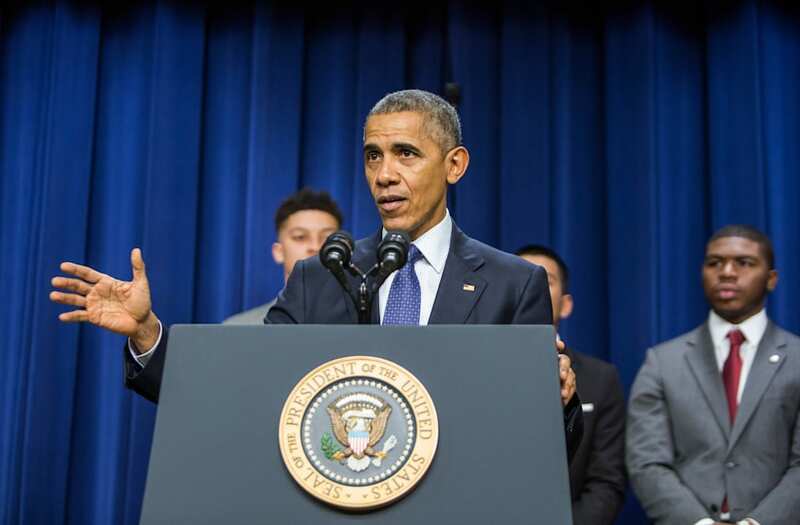 Speechwriter Sarada Peri picked a moment at a December 2015 naturalization ceremony at the National Archives when Obama spoke about the importance of immigrants and citizenship in building our country. She said his speech was all about making the new citizens feel comfortable in their new home, despite increasing instances of Islamophobia during the campaign. After the Golden State Warriors won the NBA championships in 2015, Obama — a big Chicago Bulls fan — got to show his sillier and even cool side. Speechwriter Zev Karlin-Neumann loved Obama's off the cuff remark and dance moves imitating player Steph Curry. At the dedication of the National Museum of African American History and Culture in September, speechwriter Tyler Lechtenberg said this section of Obama's speech had been changed and edited by the president himself. Lechtenberg thought the revised version better reflected the president's personal thoughts on the atrocities of slavery, the ongoing struggle of the African-American community and how they are part of our national history and integral to making this country stronger and better. "Amazing grace, how sweet the sound that saved a wretch like me. I once was lost, but now I’m found; was blind but now I see." After nine African-Americans were shot dead in their church in Charleston, South Carolina, in June 2015, Obama spoke at the eulogy service for slain Rev. Clementa Pinckney. At one point, he broke out in song, singing some lines from the hymnal "Amazing Grace." It felt heartfelt and sincere at a time when the racist massacre felt like a low point in a divided nation. A moment not mentioned by the speechwriters — and obviously penned some time ago — but worthy of inclusion for his delivery alone. It seems fitting to end at the very beginning, before Obama was even in the White House. Obama's acceptance speech that night in November 2008 when he was first elected foreshadowed the type of messages he would continue to share at speaking events around the country and world as the nation's leader. As he said that night in Chicago, "This is your victory." The fake news article isn't just showing up in the featured snippet, either. The NewsExaminer.net article also appears as the third Google search result on the page. This isn't the first programmatic fake news problem Google has had. Google recently decided to sunset its "In the News" feature after it was scrutinized for showing a false article about the US election results. In November, the top Google result for a "final election count" search declared that Donald Trump had won the popular vote (he didn't). It was written by a Wordpress blog and had been picked up by Google's "In The News" algorithm. Google CEO Sundar Pichai told BBC's Kamal Ahmed that fake news could have influenced the election, and that it needs to be stopped. "From our perspective," Pichai said, "there should just be no situation where fake news gets distributed, so we are all for doing better here." Google has not yet returned a request for comment. DON'T MISS: What is 'fake news'?